The crew and I set out on a hike in search of campsites. Time to go out and get some exercise! Our present camp is near the convergence of five, two-track trails heading out in different directions, some of which have branching trails. It’s a cool and windy day. We’ve been holed up in the BLT all morning. I’m wearing a hooded jacket, and Bridget and Spike are happy to be in their black suits again. The crew seems to carry a sense of purpose when wearing the harness suits, trotting side-by-side in front of me on-leash. Their heads are only inches apart. Bridget playfully nips Spike’s cheek without breaking stride. I love it when she does that! "C'mon, Spike. C'mon, Bridget. Find that gold nugget. 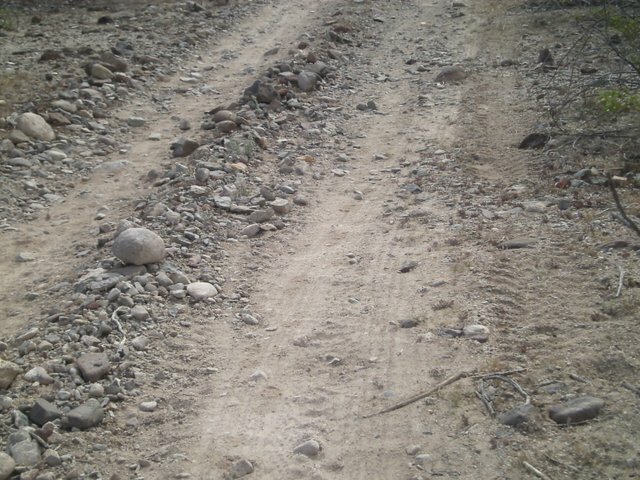 People drive ATVs up these trails looking for gold. You can tell the prospectors by the big buckets behind their seats. The buckets carry soil home to be sifted and washed in search of the valuable flakes. I fantasize about spotting a gold nugget the size of a walnut among the many rocks lining the trail. Ha! Fat chance of that happening! The trail winds its way up to a promontory. 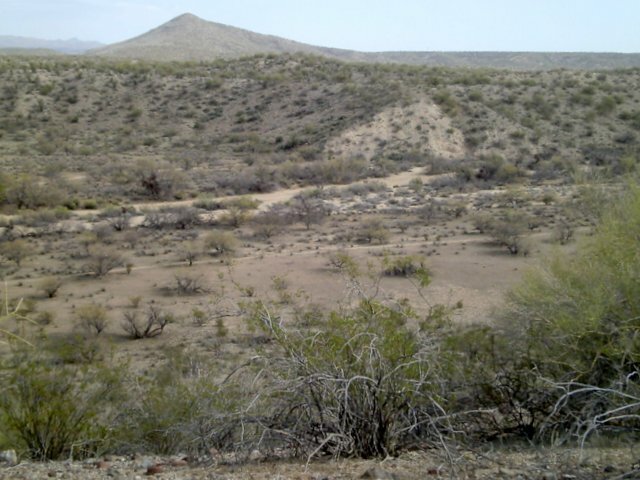 A wide, sandy wash cuts across the desert valley. The wind is whipping the palo verde branches. 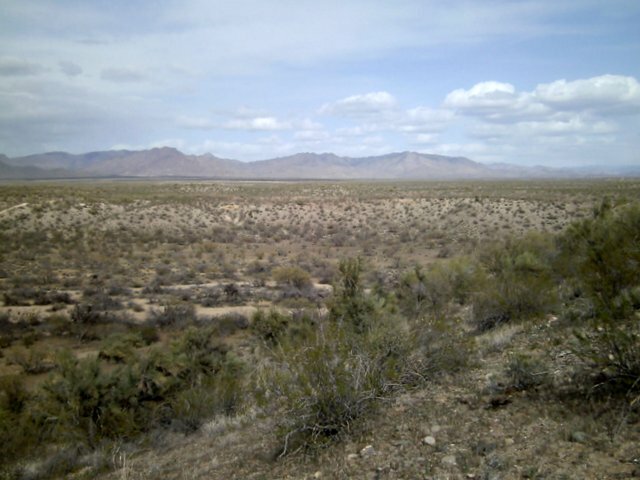 It’s exhilarating to look out over the desert for miles from this high perspective, the cool wind in my face. What a campsite this would make, up here above the world! Except if the BLT started rocking in the wind I’d imagine us rolling down to the valley below . . . I look for the horses, but no luck. I take some photos even though I know the spectacular drop to the valley will not be captured. Back home the crew naps (now there’s a surprise!). And I fix myself something to eat (another big surprise!). I go online with the intention of doing my income taxes. I received my W-2 form by email this morning. I find the site I want and . . . Oh, bluh, I don’t feel like doing this. Instead I grab my Rand McNally road atlas and skip on over to www.blm.gov. I find boondocking possibilities to the north in Arizona and Utah, which sets me day-dreaming about how the crew and I will travel through the warm months. I get up for some tea and inspect my nose in the door mirror. Looking good! I recently had a skin cancer scare. My nose developed a blemish right next to where I had the Mohs procedure done last August. Last weekend was the test. I told myself if it didn’t heal up over the weekend, I’d be pulling up stakes and heading south to Casa Grande where there’s a dermatology clinic able to do Mohs surgery. I am so relieved it healed. There’s no sign of anything suspicious. Probably all the UV protection I slather on my nose every day caused a break-out! I want to burn some paper trash. Between the wind a-blowing, and the fire raging across the desert south of here near Buckeye, I don’t think starting a fire is a very good idea! I sense a pattern here in the desert Southwest. . . four or five days of perfect weather followed by a day or two of wind. Not a bad formula, eh? What a front yard this would make! 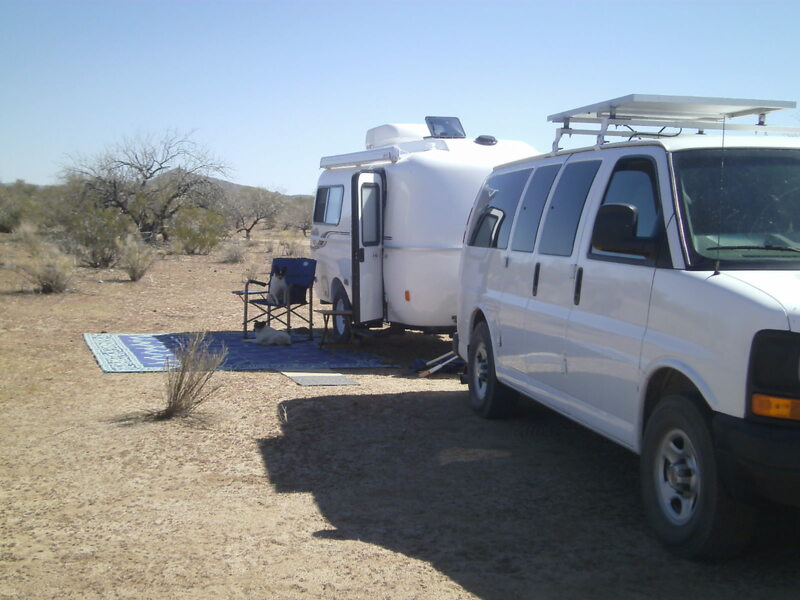 This entry was posted in Simple living and tagged Arizona, boondocking, casita, Congress, desert, MOHS, prospecting, skin cancer, Tow vehicle, Wickenburg. Bookmark the permalink. Windy here too… 45 mph gusts all day. You have a much better view of your valley than we do of our Black Range Mountains! Dust has whipped up in the winds! We are so glad you are in a great area. safe from harm and the Crew is safe from cacti thorns! Keep warm! Love the photos and hidden captions! The winds aren’t as strong here. But it’s unusually cold! It’s supposed to be back in the 80s by the weekend. That’okay, cece. I’ve been there. I ‘member not too long ago stomp’n round out there in the desert, just like where you at. Dig’n dirt, runn’n it through my “gold machine” (dry washer) an’ then sit’n down and pan’n it out. Of course I never did strike it rich…..not even close. Fount me 1 little nugget out in Calif., of course, not as big as a walnut though. The hills of that little valley would be a good place to “metal detect” for nuggets. Of course, they ain’t gonna be big as walnuts…..ya know. I sure like that RV park down there in that little valley. Make me homesick for the desert again. I wouldn’t have known what you were talking about . . . being homesick for the desert . . . before I saw it for myself. Now I know what you mean. It’s a special place. The photo makes it look like a little valley but in real life it’s enormous! You’d love it, Billy Bob. . . with or without gold nuggets. I’ve been wondering about your boondocking. It seems to me that you can do it in that part of the country, but can you do it in other parts as well? Looking around my space here in Massachusetts, where could you do it here? Or is it a southwestern type adventure….Also, you have been able to keep your solar panels charged there, but does it work on the east coast? Sorry to be so intrusive, but I may be on the road next month as a trial period and all of a sudden I have these questions. On another note, I’m glad you’ve found your stride again and are posting in a way that works for you. Love to read your posts and know someday I’ll join you on the road. I understand your concern about finding boondock/dispersed camping areas in the East. I’ve never camped in the East. I suspect it’s more difficult to find free camping areas as more of the land is privately owned or controlled by park services (state and federal). And there’s just not as much wide open space as out West. Maybe a reader will know where to camp in Massachusetts, and will let us know. I would think the success of solar power in the East would depend more on the wattage of the panel(s) than anything else. Tilting the panel(s) would be helpful in winter. You wouldn’t be camping in the winter in the northern states. One of the reasons I started out in the Southwest is the ease in finding camps. I’m not saying it’s impossible in the East. Keep searching the blogs . . . and good luck! Thanks for adding words of encouragement . ..
We do not have a rig, but are thinking to get one and have been investigating our neck of the woods…we live in central NC…and here closeby at least, we have only found one RV park that is reasonable and in fairly good shape, etc. (but is a long ways from stores, gas stations, etc.) There are state parks, etc. but so far we have not located any real boondocking places such as you are in there. Some friends travel through this state on their way places (from Pennsylvania)…if there was a place to truly boondock I would think they might have found it. Maybe some other readers have ideas for this state and others here on the East Coast. I will say driving here is daunting due in part to the horrid roads. Even freeways are not like the West (where there is wide lanes and wide places to pull off.) And drivers here in this state at least, are strong believers in NOT using a turn signal…they love to keep other drivers guessing. Even though we live in an area that is not that large…seems not to matter. Driving in Seattle when visiting relatives is a piece of cake by comparison!!! Elizabeth . .. You bring up something else that makes camping in the West easier than the East. Many roads, stores, and other facilities seem to have been built with the rver in mind. . . big turn-outs, wide roads, and plenty of maneuvering space in parking lots and gas stations. In Florida, and I believe in most of the eastern USA, you can boondock in National Forest areas for up to 14 days. Some are primitive campgrounds that charge a small amount, but most are free. I think you could probably search the internet to find them! Here is a list I found online of National Forest Campgrounds, listed by state. I just love to see your perfect tow vehicle and your perfect rv sitting there all alone in that great big desert. It really looks just……….PERFECT! Hubby and I have been having moles carved out, beginning skin cancers burnt off, etc. this last year…so once again, you have provided some great information!! THANKS!! Where to go, if in future, we are out as you are and notice something needing attention!! You do wear some kind of hat while outside, right?? Have you considered Idaho as a place for summer? It can get quite hot, but USUALLY cools down at night. Last summer and the one before were not as usual…but in general, you must always have a jacket with you, all year around…cause after sundown, it can get downright chilly, even in summer. I would love to explore Idaho . . . the beautiful rivers, mountains, vegetation. The only reason I haven’t mentioned it is the distance . . . I don’t know how far I’ll get from here this summer. I want to make a loop into CO and down into NM again. Idaho is on my bucket list for sure. It’s a gorgeous state. I wear a hat all the time! After my skin cancer episode I tried wearing one when I thought I needed it and then so many times I forgot it. So I resolved to put a hat on my head when I get up in the a.m., and leave it on until the sun goes down! Good idea to get any potential skin cancer spots removed. The kind I have is not associated with moles. It could pop up anywhere, like on the nose. Here in the Southwest, a jacket is needed after sunset, too. . . but maybe not in the summer! Yea, my skin is like yours…hubby is the one with all the moles….I think I like the getting burnt type better than the being “dug out” type!! I got burned a few times in my youth, but never on purpose, but with freckled skin, it is a given I guess. You think if you go to the higher altitudes in summer out there, that it will be cool enough? Our son used to live in Carson City, Nevada…seems the days were not as hot as some other places that are rather desert like. But then it is nearly 6,000 ft elevation too. Good news on the nose eh. We should be back about mid afternoon Thursday in case you need a hand with a move to a different location. Thanks . . . I’m not moving today. I might move when it’s time to dump tanks or fill the water tank. I also like to find possible campsites for future winters. Spike snuck up to your place this morning. I hope he didn’t leave any deposits! Not really any bad views of the desert. We had a few flakes of snow today. You got snow! I was wondering how you were doing at your elevation, especially with the wind. I can see the long grade of road going up the mountain to Yarnell from here, on the other side of the desert valley. It’s certainly worth the drive. Give me a few days after Berta gets home from surgery and I’ll give you the royal tour if you’d like. Hey Sue, as a long-time desert rat, I wear a hat, sunglasses, and a sun mask – the the same things as you see in pictures of burglaries (and thus serve a dual purpose if you go broke). They’re a very lightweight tube that you pull over your face, and some have extra UV protection in the fabric. Easy to breathe through and also keep dust out if it’s windy. You can also use a bandanna, but the sun masks are easier to keep in place. I also always wear long pants and longsleeved shirts, even when it’s really hot, as the trans-evaporation beneath the fabric actually cools down your skin. There’s a reason the Arab Bedus wear long draping fabrics. I hate sunscreen, and with this routine, I don’t need it. It also keeps the gnats off. I wear long pants and longsleeved shirts a lot more than in my younger years. It’s difficult to do that in the summer. . . Shorts are so comfortable on a hot day! I’ll check the link about the mask. It probably would be good to wear when hiking. Probably Bridget would be scared of me at first . . . Thanks for the good advice and the link. ADDED LATER: I looked at the mask. Don’t laugh at this question . . . How do you see? Does it go over your eyes or do you just pull it up over your nose? Sue, you pull it over your head like a turtle neck down around your neck, then pull it up over your nose when you’re out. That’s why they’re so lightweight, so you can breathe. They protect your whole face and neck from the sun, up to the bottom of your eyes, but are easy to pull down when you don’t need them. I also wear mine in the winter as additional head warmth, as you can pull it up over your head in the back. They usually come with directions on all the many ways you can configure them, even as a balaclava. You can get them for half the price in the REI link if you look around. I tried to comment on your Spotted Dog Ranch blog and I didn’t get any further than clicking on the word comment! I wanted to tell you how much I like your writing! Thanks Sue, no idea why it’s not working, but thanks for the good word, much appreciated and the feeling is mutual! OK, I see what’s going on, it does open the comment box, but you have to scroll down to see it. The new dynamic Blogger is still a bit quirky – I lost my old format trying to make my screen wide like Al’s. He said to save it, but I couldn’t figure out how. But I was tired of the old one anyway, LOL. I would use WordPress, as I’ve herad it’s better, but I’m too lazy to learn a new program. How wonderful to pull out the maps and decide where you are going to “live” next! Your desert looks pretty good from the San Juan Mountain town of Ouray, Colorado… where spring doesn’t come till June. I looked at the forecast for Moab, Utah (only a couple hour drive from here) this morning and it called for mid sixties for the next 10 days. Time to hook up the camper and join in on the fun. The arrival of Spring gives us the urge to get out and see the world. Temps will be rising more quickly now. Soon it’ll be time to make those dots on the map turn into real experiences and great memories. I have my specially designed UV protection hat I got at Quartzsite and another similar one given to me by friends back in NM . . .
It’s pretty nice over here in Moab right now, and no tourists…yet. My heart just yearned to be out there too after reading your posts. I guess I’ll start the process of setting a date and get my ducks in order. Gotta get a new vehicle, save some money, etc…Probably take 3-4 years to get it all together, but your adventure and lifestyle inspire me. THANK YOU! Get it together, Pat! If you’re yearning now, you’re going to LOVE this life. Slap those ducks into line! You’d love the desert, too, I’m sure, if you were seeing it like I am. . . and in the winter! I’d also love to camp next to a river or lake in Vermont, but like other commenters have said above, it isn’t easy to find free camping or even inexpensive camping . . . which is crummy. Maybe in the Adirondacks of NY? I haven’t got much to contribute to the skin cancer discussion. I’ve had about 6 or 7 burned off my hands, but that was last year, and nothing since. But I can’t remember if you ever solved the “what do I use for a desk” problem. My stepson and his wife have a new baby, and new baby stuff takes up a lot of room. They’ve put away the big table in their dining area to hold it all, or most of it. So I found them 4 natural wood TV tray tables at Walmart for 9 bucks apiece. They eat off them, set two together to write and look at the computer, use them to hold baby stuff, etc. Then they fold up quickly and store flat in a corner when not in use. It struck me that’s a good description of a Casita oriented desk. Only half the price. I really like that they can’t collapse on you if you bump into them. A metal rod prevents it. But I suppose they could be turned over, if you or Spike were really determined. They’d also be easy to take outside. But the wind might get them. Or maybe I just missed where you solved this problem. What do I use for a desk? I don’t really need a desk inside because I hardly ever do “paperwork.” All banking and correspondence is online. I keep necessary hard copies in the cabinet above the dinette table that’s set up in the rear of the Casita (on a pedestal tube that came with the trailer). That table is all the desk I need. My laptop sits on it. I rarely eat indoors. When I do, I push the laptop back to make room for my plate . . . eat and blog . . . multi-tasking! Congratulations to your family on the new addition! Funny how someone so small can turn a house upside down . . .
I’m glad your skin cancer is gone and is staying gone! All live in an Egg. Wouldn’t you? They’re living quite large. It’ll do. Hi Sue, K and I returned to the lake Tuesday and I remembered you asked about the level of the lake. It’s up a bit from when you were here….you can’t see any land between the shore and rattle snake island. That will change as they are already preparing feilds down south (oh, we are down south)! When we left St. David, we stopped at Benson to top off the tank. When I put the MH in ‘drive’ it started forward and then stopped! We used the Ranger in 4 wheel low to push the coach out of the bay (thank God for a homemade hitch) and sat there as our lives passed before our eyes! Had it towed to Tucson (blown ((very leaky)) torque converter) and returned to NM somewhat ‘lighter’. Oh well…K said, no big deal…let’s check Susan Blog! We knew there was a reason we met you. Cheers BR, K and kids. Egads, Bill! What a nightmare! I’m so sorry bad luck came your way. I like Kathy’s cool attitude . . . “no big deal!” So your MH is in Tucson AZ and you’re in Elephant Butte NM. What a headache. Good thing you had your Ranger with you and it was able to get the MH out of the way. Thanks for the update on the lake. It would be so nice to camp in the boondock area with the lake’s edge nearby. . . instead of having a half-mile walk across Hungry Coyote Beach! Even so, it’s a beautiful place. Isn’t the WiFi great? Imagine the day when all state parks across the nation have WiFi for campers. Elephant Butte is cutting edge! Keep smiling, guys . . . The crew and I send you all good-luck wishes!